Door Gods, as the name implies, are two deities standing guard over the door. Posting Door God pictures was a popdlar custom observed in ancient China. However, nobody can tell who the Door Gods are. Some say they are Zhong Kui and Yu Lei; others say they are Qin Qiong and Yuchi Gong; still others say they are Generals Wen and Yue. Some have said Door Gods are just Door Gods and that painting two brave warriors on the door is all right, but who cares who they are? Pictures of Door Gods were nailed on the doors to ward off evil spirits. In the remote past, people offered sacrifices, like they did to the Kitchen God, mainly to show their respect for the creators of the houses, doors and windows for providing shelter against the elements, beasts and enemies. Many records about Door Gods can be found in ancient Chinese classics. The following story had a great influence among the common people. Long, long ago, there was a large peach forest on Dushuo Mountain in the centre of a sea. Two broth- ers, Shen Tu and Yu Lei, lived in a stone house under a large peach tree. Both were honest and upright, and both were men of unusual strength sc that ferocious beasts such as lions, wolves and tigers all stayed away from them in fear. The small peach- es in the tree were fragrant and sweet; the large ones, when eaten, were said to be able to turn people into immortals or deities. Northeast of the mountain was Wild Ox Ridge, on which lived a vicious Wild King who often ate the hearts and drank the blood of the local people. When he heard that one could become immortal after eating the large peaches on Dushuo Mountain, he sent one of his men there to get him some of the peaches. But the two brothers refused and said, "Our peaches are for the poor, not for any king or emper- or." So saying, they drove the man out. Hearing this, the king flew into a rage and went up the mountain with three hundred soldiers. The two brothers with their guardian tigers engaged them in a fierce fighting. The king was defeated and fled in panic. Back in Wild Ox Ridge, the king worked on a scheme to get his revenge. On a windy, pitch-black night, when the brothers were sleeping in their stone house, they heard a loud noise outside. They opened the door to face scores of green-faced and long-toothed demons. Undaunted, the elder brother broke off a peach branch and the younger brother took some reed ropes and together they went to meet the demons. The elder brother grabbed one demon after another, while the younger one bound them up one by one and fed them all to the tigers. These demons were all the king's men in disguise. The news spread far and wide the next day. People were grateful to the brothers for getting rid of the evil spirits. Then the brothers' names became known by more and more people. The legend says that after their death, they became immortals and lived in the Heavenly Palace. The Heavenly Lord then entrusted them both with the task of eliminat- ing all demons that came their way. Whenever they met a demon, they just bound him hand and foot and fed him to tigers. It was said that as they lived in the peach forest, so peachwood could exorcize devils, too. Henceforth, common people all placed peachwood tallies inscribed with the names of Shen Tu and Yu Lei on either side of their gates to dispel evil spirits and bring peace to the family. Some people had pictures of the two brothers drawn and posted on their gates to become "Door Gods." In the Tang Dynasty, people regarded Qin Shubao and Yuchi Gong as Door Gods. According to D~'ties of Three Religions, once when Emperor Taizong (r. 627-649) fell ill, he dreamed of ghosts howling and throwing bricks at him. In the war to found the Tang Dynasty, he had killed many people. So in his dream he saw many ghosts asking him to give back their lives. The emperor was frightened and woke up in a cold sweat. Then his two brave generals, Qin Shubao and Yuchi Gong, put on their armour and stood guard on either side of the palace gate, thus ensuring a peaceful night for the emperor. The emperor then asked a court painter to draw a picture of each of the two generals to hang on both sides of the palace gate. Common people then fol- lowed this practice to dispel evil spirits and handed it down to posterity. This was the origin of the Door Gods. The pictures of Shen Tu and Yu Lei, like Qin Shubao and Yuchi Gong, were also painted in the style of warriors so as to scare away demons. The images of the Door Gods were mostly based on the Four Heavenly Kings in the temples. They were the four heavenly dharma protectors of Buddhism. They originated from the Indian mythol- ogical "Four Heavenly Kings to protect the world in the four directions of east, west, south and north." The kings were mostly buckled in their armour, with thick waists, holding a sword or an iron staff and standing on guard with an angry look. In some places, people simply used exorcizing inscriptions instead of Door God pictures. According to records, in 1119, during the Northern Song Dynasty, the Door Gods in the national capital of Kaifeng all wore tiger-head armour and held a spear standing guard at the gates of the houses of the princes. During the Shaoding reign (1228-1233) of the Southern Song Dynasty (1127-1279), pictures issued by Emperor Lizong (r. 1225-1264) became those of Zhong Kui. In the Ming and Qing dynasties, Door Gods varied in different places. 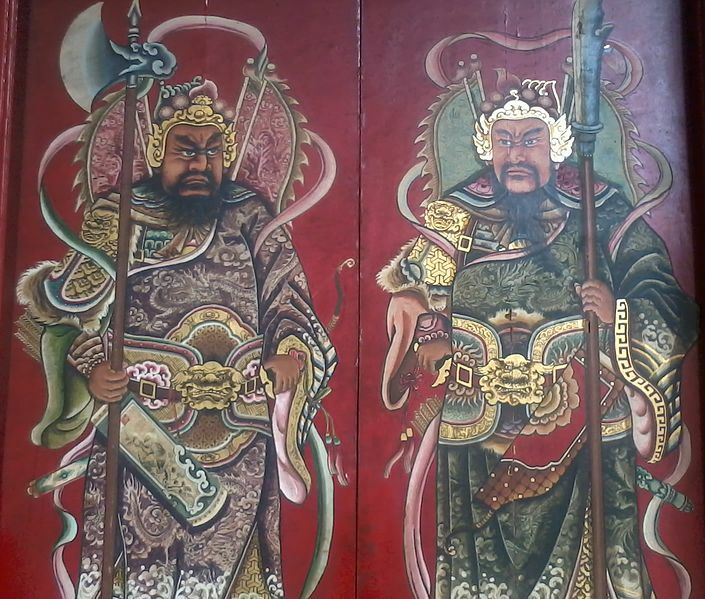 The Door God pic- tures in Xinxiang, Henan, included brave generals of the Three Kingdoms Period, such as Zhao Yun (?-229) and Ma Chao (176-222), and a Taoist priest named Ran Deng. In the Hanzhong area of Shaanxi, the pictures of Sun Bin, a strategist of the Warring States Period, and some others were posted as Door Gods. In the period of the Qing Dynasty, Emperor Qianlong (r. 1736-1795), pictures of Door Boys in- stead of Door Gods were posted at Yangliuqing, the town famous for its New Year pictures. In Records of Xiangfu County, it is said that Door God pictures produced at Zhuxian Town were all images of generals or court officials, complete with pictures of bats and other insects traditionally symbolizing aus- piciousness.